Before I discuss our own show, I’d like to tell you about Hannover Fair 2003, which was held April 7-12 in Hannover, Germany. It’s the largest capital goods trade show in the world, and AGMA has now exhibited in this biennial event four times in a row. At this year’s six-day show, AGMA President Joe Franklin and I staffed the booth, which was located in the Power Transmission Distributors Association Pavilion. Magnificent to behold, the fair boasts more than 6,200 exhibitors–including more than 1,300 gear and mechanical power transmission stands–some 200,000 visitors from 60 countries, and more than 2.5 million square-feet of exhibition space spread among 25 halls. It is something to see, and it has definitely stood the test of these difficult times. While not quite as large or well-attended as the 2001 fair, given the extremely difficult circumstances surrounding the event–the downturn in the global economy, the war in Iraq, and the fears surrounding SARS–it far exceeded the expectations of the organizer, Deutsche Messe AG. My own experience is worth relating, because it made me realize that, in tough times, even such immense events can be vulnerable to economic and other external factors. Yet the show did go on, and it was successful due to event management, and also the dedicated exhibitors, who took something of a chance by participating. Choosing to attend definitely paid off for them, though, because they took advantage of the opportunity. As for AGMA, being there allowed us to maintain an international presence and to recruit new members, as well as to connect with potential Gear Expo exhibitors. Historically, the sale of Gear Expo exhibit space and recruiting potential members have enabled us to recover much of our costs, and we were successful on both counts this year. Why? Because, like other exhibitors there, we took advantage of the opportunity. We could have cancelled, but we didn’t, and it paid off for us, too. Gear Expo 2003 faces similar difficulties: specifically, the continuing recession prevailing in the industry. Until the economy improves, trade show organizers and exhibitors alike have to keep moving ahead together. The challenge for AGMA is in attracting exhibitors, and then working with them for our mutual benefit. 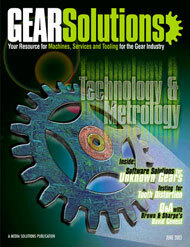 Our primary aim is communicating to the worldwide gearing audience that Gear Expo 2003 offers many tangible benefits. Our approach is simple. First, Gear Expo is still the most cost-effective trade show in the industry. As an example, our space rates have risen less than 1 percent since the show began. Second, the show is in Columbus, Ohio: a first-time venue for Gear Expo. Columbus is right in the middle of “gear country,” with a state-of-the-art exposition facility and a variety of hotels near the Convention Center. Plus, Ohio is a “right-to-work” state, which helps lower exhibitor’s costs. There are many restaurants within a few blocks of the Convention Center, and the city is easy to reach from almost anywhere. I personally think that this venue offers us a very exciting opportunity. Third, we’ve been extremely flexible with space payment plans for our exhibitors. Many companies experiencing cash flow problems have asked if they can delay payment, or reserve space temporarily without putting down a deposit. While we don’t generally agree to such arrangements, it’s worthwhile if it encourages exhibitors to attend. Fourth, Gear Expo continues to deliver one of the main reasons people attend trade shows: face-to-face interaction. In a recent study conducted by the Center for Exhibition Industry Research, 75 percent of those surveyed rated face-to-face interaction with potential vendors or suppliers as “very” or “extremely” important. Further, one-third of visitors rely on face-to-face interaction to make final purchasing decisions. This should help potential exhibitors decide to exhibit, realizing that an investment in Gear Expo will give them a competitive edge. So, plan to join us October 5-8 in Columbus. For more information, contact me at (703) 838-0051, or via e-mail at medert@agma.org. More information about Gear Expo 2003 is also available on our dedicated Web site [www.gearexpo.com].